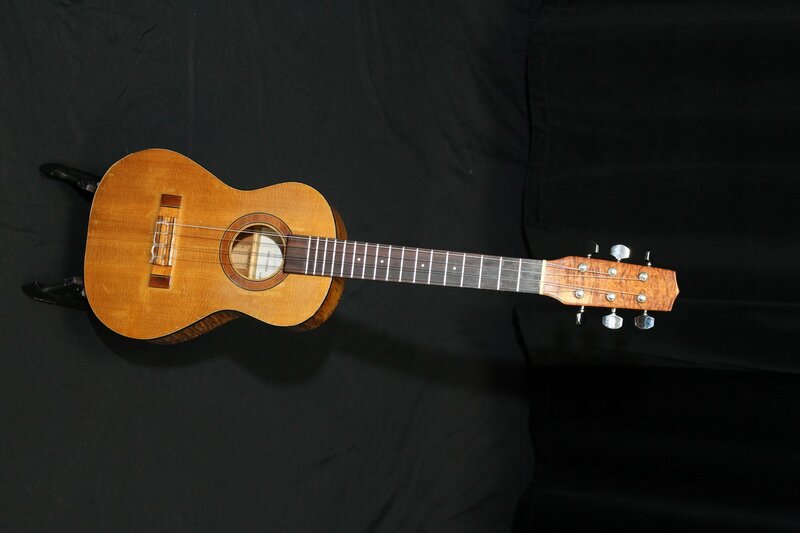 Ron Yasuda was a Hawaiian Luthier who worked for Kamaka from 1958 to 1977, after which he began building on his own. Ron handbuilt every ukulele himself. This particular ukulele is solid koa back and sides with a solid spruce top. It is a 6-string with octave G and unison E strings. The E strings could probably be tuned in octaves with some experimentation with different string gauges. There is a 3/4 inch section of black binding missing on the lower bout and a small section where the side bulges out slightly from the top. It also has two repaired cracks on the top and a repaired crack on the sides near the heel of the neck. There is some finish wear mostly on the top and back of the neck from years of playing. The person I purchased this instrument from says she bought it from Ron in the 50's but I suspect its more likely a late 70's, when Ron began building on his own.